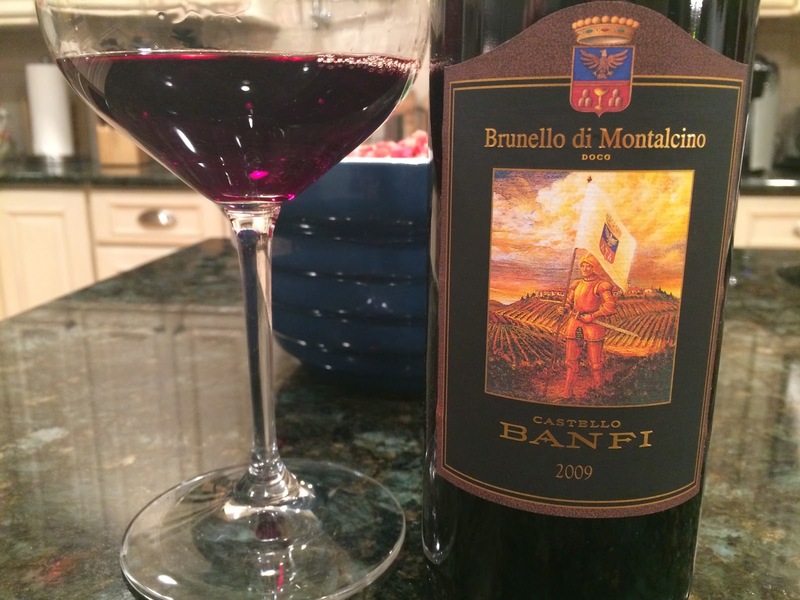 It’s been a little over a year since I published my report on 2008 Brunello; a vintage characterized by elegant, racy wines with wonderful aromatics. Although I’ve not yet had a 2008 I thought needed additional cellaring, looking back, I think many of these wines will have a longer drinking window than first anticipated. Vintages can be tricky. The mercurial side of Mother Nature can be unanticipated and unforgiving. Every vintage has it’s own characterisitcs and it’s hard to recall two back to back years that are as different stylistically as 2008 and 2009. 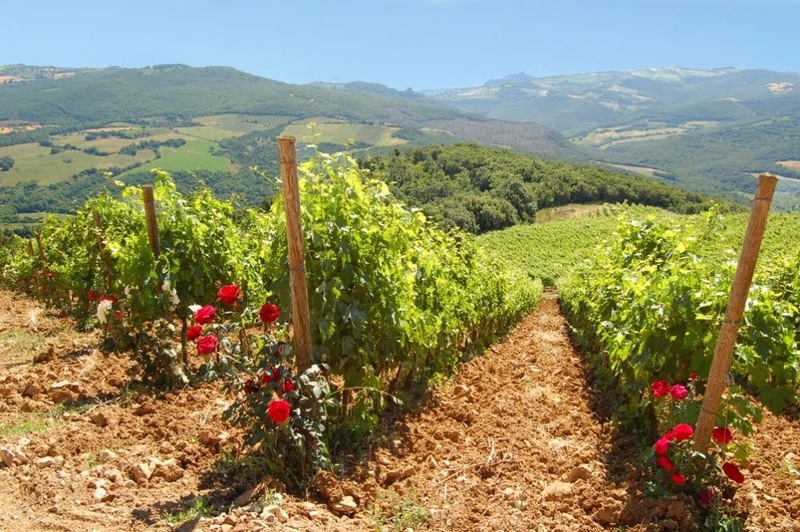 The 2009 growing season in Montalcino will be marked as one of the hottest vintages recently recorded. A massive heat wave that arrived suddenly in August put a lot of stress on the vines and caused rapid spikes in sugar that were far ahead of any ideal ripening window. Sudden swings in temperature at such a key stage in the ripening process are not ideal to say the least, and as the heat wave extended into September, it clearly left its mark on the fruit and the resulting wines. Many of the wines we tasted for this report show very ripe levels to their fruit. Some exhibited an almost roasted character and many were over 15% alcohol. Conversely, many recent Napa Cabernets I’ve enjoyed have had alcohol levels of 13.5% -14%. If that doesn’t speak volumes, I don’t know what does. Generally, the wines are full of fruit, forward and display reduced levels of complexity. They will drink well early and likely offer little reward for cellaring. However, I don’t share the opinions of some who suggest they are displaying advanced aromatics and lighter overall colors. In referencing the latter, color is one of the easiest things to manipulate in a finished wine given the regimen of barrel aging and the styles used to do so. Furthermore, certain members of the wine press were decrying dark colored Brunello that looks like any grape but Sangiovese. Now that many of the wines show more traditional colors, they suddenly appear “overly advanced”?? Holding the appellation to a damned if you do, damned if you don’t standard is unrealistic and unfair. Colors varied across the spectrum in this report from ruby to blackish red, a fact that will become evident as you read. I think this is a telling statement. Good Brunello were scattered throughout the zone in 2009 and many of the factors that led to excellent wine were human decisions. That can work against the vintners because in many respects, there is very little knowledge sharing in Montalcino. There is only reluctant openness among producers when sharing information about tactics to manage difficult weather, when and how best to employ them, and perhaps most importantly, when to harvest. Communication is one area where the region can modernize its thinking in an effort to improve its wines. Centuries of thinking often become institutionalized, but Montalcino must realize that its reputation – clearly global – is only as strong as its weakest producer. In this case, knowledge isn’t power. Sharing knowledge is power. As is the case with all comprehensive Tuscan Vines tasting reports, all wines were tasted with and without food in a casual relaxed setting with a keen eye toward preparing dishes that would allow the wine to show best. Almost all wines were decanted 30-60 minutes prior to the initial tasting and many evolved slowly over the course of the meals. Suggested Retail Prices have been provided by the Importers & Distributors that provided the samples for review. In my experience, actual retail prices vary greatly and are typically noticeably less. Shop around. In 1996, Mario Bollag, former owner of the renowned estate Il Palazzone, broke ground on what was to become his premier winemaking estate. 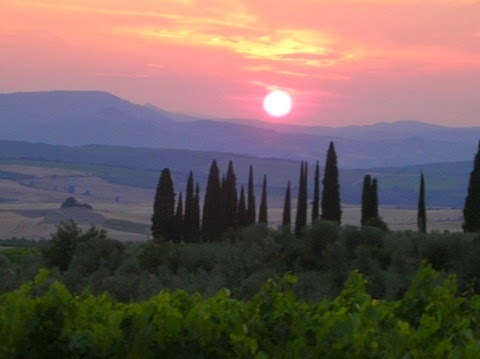 Terralsole, “toward the sun”, is located south east of Montalcino in the eastern edge of the Brunello zone. 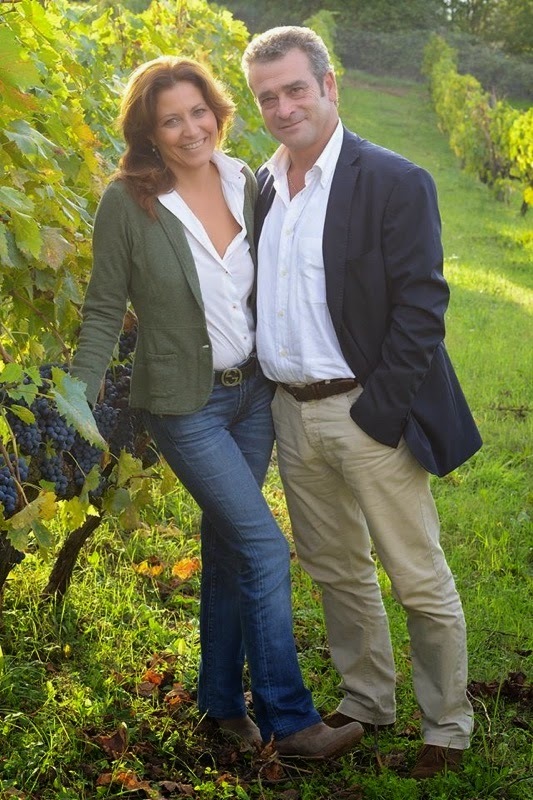 With his wife and partner, Mario produces classically styled Brunello. His philosophy is simple: “Giovanni, wine is made in the vineyard, not the cantina” he told me. This principal led him to specifically choose the clones and rootstocks he planted in 1996 that were ideally suited to his soil. Fermentation takes place in stainless steel and aging in 600 liter tonneaux. 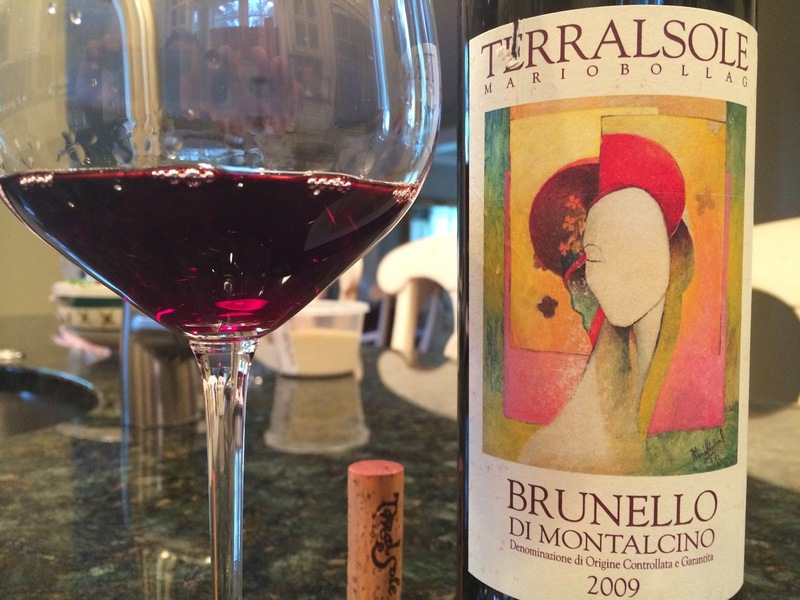 The 2009 Terralsole Brunello was not yet released on the market when we tasted it. As such, we gave it almost 90 minutes in the decanter to allow it to settle and evolve. The wine is a bright deep ruby with wonderful spice and fennel on the nose that join the ripe berry aromas. Racy fruit, with finely grained tannins and ripe crushed berries on the palate. The tannins are in check at this young stage and don’t seem out of balance. There’s ample acidity to carry the weight of the fruit. I really liked this wine and perhaps this was among the first exceptions, as it was not as ripe as I thought it would be. Delicious with risotto stuffed peppers. 90 points. No price indicated as the sample was winery provided. Released September 2014. One of the loveliest wines in my 2008 report was the Col d’Orcia for its delicate floral aromatics. Nicola Giannetti and the team at Col d’Orcia have revived this winery in recent years and they’ve crafted a brilliant successor to their 2008. He was one of my first interviews. “He” is 4th generation winemaker Giacomo Bartolommei – a young energetic winemaker who recently has added several “tre bicchieri” awards to his list of accomplishments. His family pride is contagious and when you sit with him, it’s possible his energy is rivaled by some, but it’s not easy to imagine. The 2009 Caprili Brunello was one of the first wines tasted for this report with an alcohol level of 15%. At the time, I thought it notable, but a parade of future Brunello showed this to be commonplace. Regardless, the wine is impeccably balanced and you’d never peg it at 15%. In the glass, it’s a goreous bright violet color, through and through. The nose is filled with crushed berry, spices, autumn leaves and fresh mulch. I love how it smells. On the palate, this is absolutely delicious. Rich, ripe fruit is balanced well against a fresh acid backbone. Flowers, spices and crushed fruit dominate the palate. Compared to some of the other 2009s that seem ready to charm early, this wine seems to have the architecture to cellar mid-term. I wrote “yum” on my tasting sheet. 92 points. SRP ~ $50. 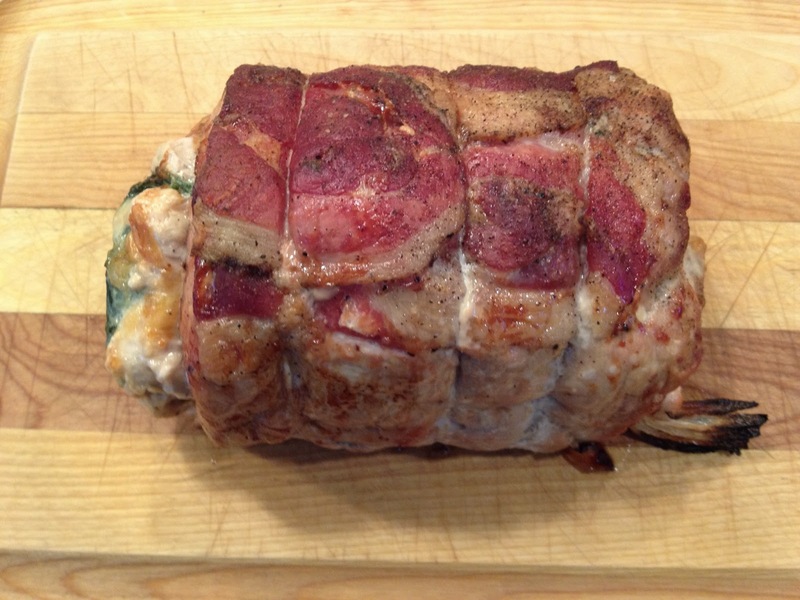 Many of the Brunello tasted for this report were opened alongside roasts like the one pictured below; wrapped in pancetta, and stuffed with spinach and fontina. Roasted fresh fennel on the side…. Located near Castelnuovo dell’Abate, the Altesino estate is an iconic producer with a storied history. Fruit for the estate Brunello – Altesino also makes a Cru Morisoli Brunello – comes from 4 vineyards that were planted as far back as 1981. Winemaker Claudio Basla’s hallmark is terroir driven wines and to that end, only stainless steel fermentation takes place which keeps the freshness alive in the wine. Aging is in Slavonian barrels from 5,000-10,000 liters in size. 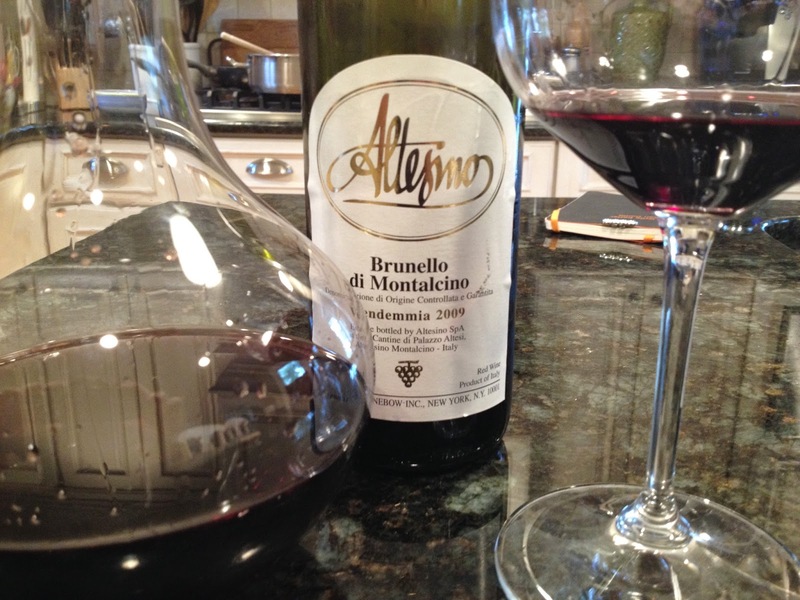 The 2009 Altesino Brunello displays a deep blackish ruby color in both the decanter and the glass. The nose of the wine is rather remarkable for its asian and Christmas spice notes. There’s hints of nutmeg and a noticeable trace of cinnamon that are very attractive and play well against the ripe red cherry fruit. Good medium body with a slightly jammy note that’s not surprising given the heat of the vintage. More tannic than expected, this mellowed considerably with the roasted pork pictured above. Could use 1-2 years of cellaring to mellow further. Very nice indeed. 90 points. SRP ~ $60. 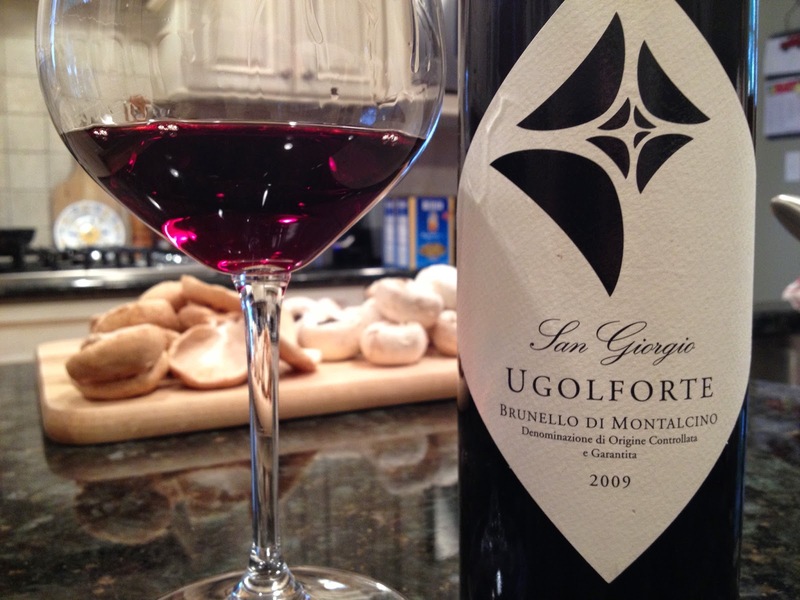 Named after a 12th Century bandit that led the people of Montalcino against the ruthless oppressors from Siena, Ugolforte now lends its name to the next wine in our tasting. Tenuta San Giorgio lies not far from the Abbey at Sant’Antimo at 350-400 meters above sea level. Soil conditions range from clay, to chalk and loam and this reduced minerality is present in the wines. The 2009 Brunello Ugolforte is aged for one year in French barrique, 50% of which are new and 50% of which are one vintage old. Remaining aging takes place in large Slavonian cask. This 2009 shows some advanced color with a medium ruby core that trends to brick and orange highlights at the rim. The somewhat straightforward aromas of crushed fruit are joined by warmed spices and mellow sandalwood. On the palate the wine is spicy – with lots of pepper, bright red fruits and soft mineral notes combining in the medium bodied frame. Seems somewhat understated at the moment. 89 points. SRP ~ $55. Ferenc Mate has travelled a long road from his Hungarian roots to the twisting roads of Tuscany that led him to the dilapidated estate he purchased with his wife Candace. After a remarkable transformation, the likes of which included audiences with Angelo Gaja, Ezio Rivella and a cantankerous Roman “real estate” mogul, the gorgeous Mate estate is perched between Castello Banfi and Pieve di Santa Restituta. Ferenc personally manicures every vine while Candace toils in the cellar. Their efforts are noteworthy. 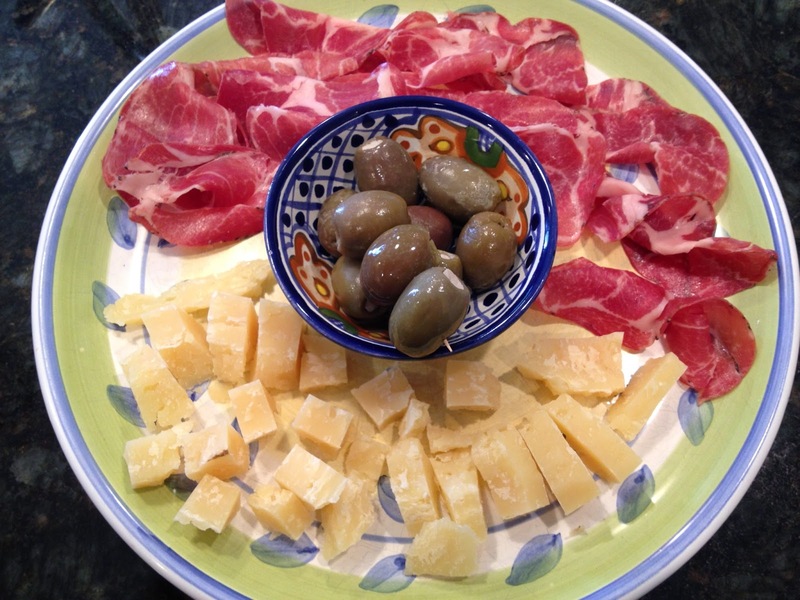 Tastings usually start casually – around the kitchen island with antipasto, bread, and the wine until we slowly progress to dinner. Marilisa Allegrini has little to prove in the Veneto. Her family’s wines are spectacular up and down the spectrum, whether it’s the workhorse Palazzo della Torre, the Super Venetian La Poja or the classic Amarone. So what’s the baroness to do? Expand to Montalcino that’s what! 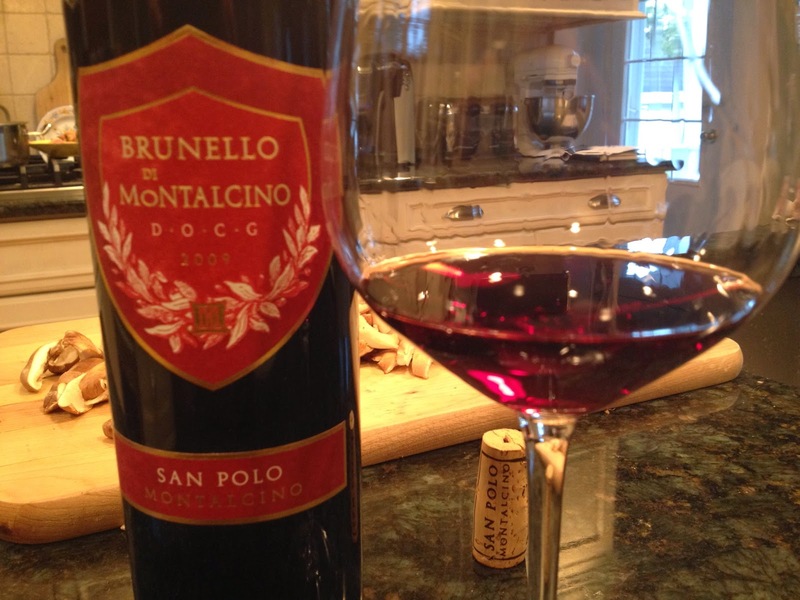 The 2009 San Polo Brunello is produced from 23 acres of estate grapes that have optimal exposure from a southeast facing vineyard in the shape of a naturally occurring ampitheater. Organic and biodynamically produced, the wine is fermented in glass lined concrete tanks which help retain the aromatics of the wine. Aging takes place in French tonneaux with winemaker Riccardo Cotarella at the helm. It wasn’t long ago that I spotlighted an amazing Rosso di Montalcino from the all female team at Donatella Colombini. The team rolls on with this latest effort. 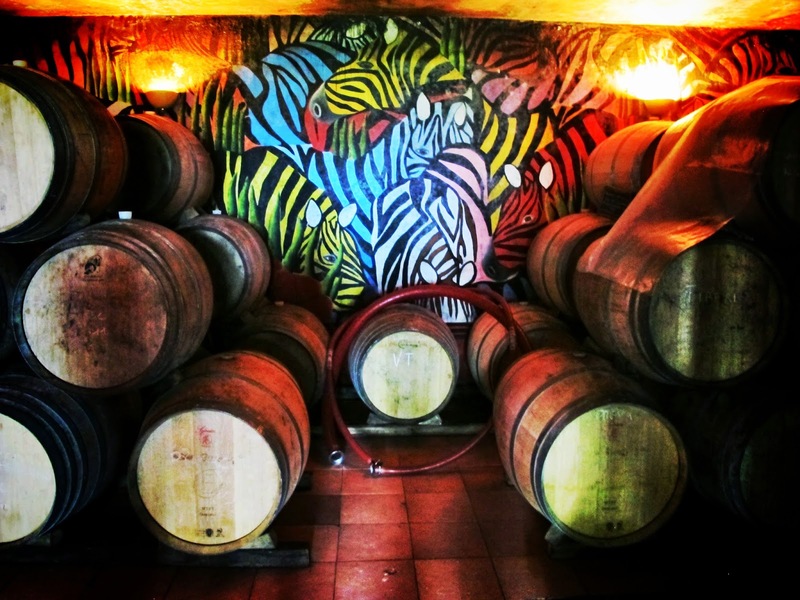 I’ve written much on these pages about the gem of a winery that is Il Palazzone. Tucked on a beautiful property not far from the center of Montalcino, Laura Gray and her husband Marco tend cellar and vines meticulously. This was my second tasting of Il Palazzone’s 2009, the first coming earlier this year on the estate. The 2009 Il Palazzone Brunello is a shimmering crimson red with violet reflections ever so light at the rim. More aromatic than it was this summer, you can easily pick up ripe crushed cherry, asian spices and tobacco notes on the nose. On the palate, the wine is still young and very primary. Crushed cherry gives way to an ever so slight powdery, dusty tannic backbone. This still needs time in the cellar, but with the increased aromatics, it appears heading in the right direction. 91 points. SRP ~ $75. 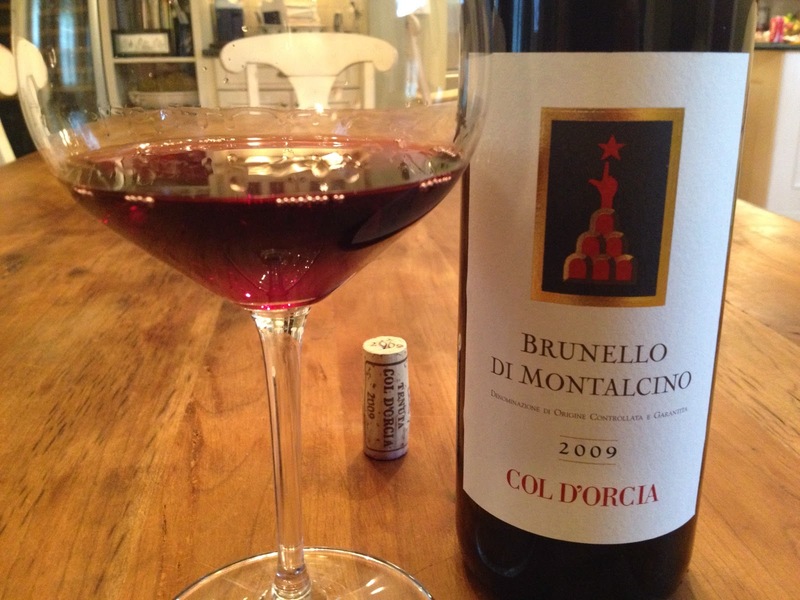 “Alessandro Mori and his Brunello blend to the point that the man and his wine don’t seem to have a sharp boundary. Maybe theirs is an empathy, a way of living and sharing the moments of life, a coexistence in which alternate moments of love, moments of confrontation, and moments of comfort tug at each other….until you get to say that one would not be the same without the other.” I cannot improve on such an introduction. 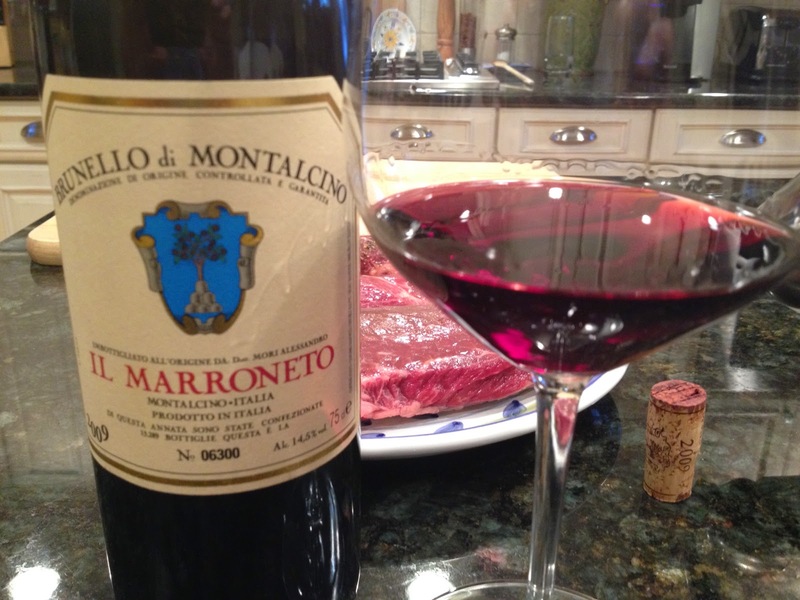 The 2009 Il Marroneto Brunello displays a wonderful classic color of medium ruby with a slow fade to copper at the edge of the bowl. The aromas are fairly complex here with berries, spice, rosemary and flowers. The floral nature of the wine is imparted from the coolness of the vineyards – Il Marroneto’s vines lie about 450 meters above sea level. On the palate, there is a large core of ripe berry fruit and a massive wall of tannins. This is the most backward of the 2009’s I’ve tasted thus far. Chewy and although much better with grilled NY strip steak, a candidate for the cellar. The wine finishes with Tuscan road dust and a meaty, savory component. Very nice and traditionally crafted. Cellar 3-5 years. 91 points. SRP ~ $50. Next up was the Castello Banfi Estate Brunello. Located about 20 minutes south of Montalcino center, near Sant’Angelo Scalo, Castello Banfi sits on beautifully exposed property. From extensive vineyard holdings that range in altitude from 200-500 meters above sea level, Castello Banfi is able to moderate the extreme effects of climate in any given vintage and Rudy Burratti’s hand showed well in 2009. 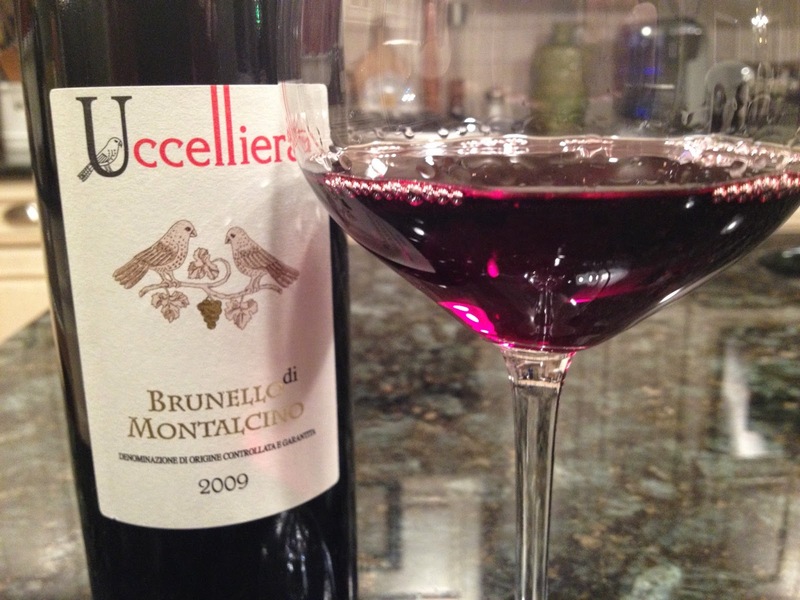 The 2009 Brunello is a dark ruby with brick and violet highlights at the edge of the bowl. Very pretty aromatics with roses, tea leaves, crushed cherries and fresh suede. Wonderful ripe berry fruit on the palate with lots of juicy, bright acidity. Dried herbs and tobacco appear toward the finish. More lively and fresh than I expected. Moderately tannic. An excellent 2009 and one of the tops in this report. 92 points. SRP ~ $50. Marchese Frescobaldi’s estate is one of the larger properties in Brunello at just over 152 hectares. Southwest exposed, the vineyards average 15 years of age and sit between 250-450 meters above sea level. Located in the southwest portion of the zone, it’s clear that the heat of the vintage asserted itself on Castelgiocondo. The 2009 Castelgiocondo Bruello is a deep blackish ruby colored wine. Almost impenetrable. The nose offers up lots of ripe red and black fruit aromas with baking spices, and toasted cloves. On the palate, the wine is ripe almost to the point of appearing raisiny. Loads of red fruits are supported by a toasted hazelnut and Christmas spice frame. Lots of dusty tannins on the finish where the warmth of the alcohol presents itself slightly. A more modern take on Brunello and I think a wine Napa Cabernet lovers will find very attractive. 90 points. SRP ~ $70. 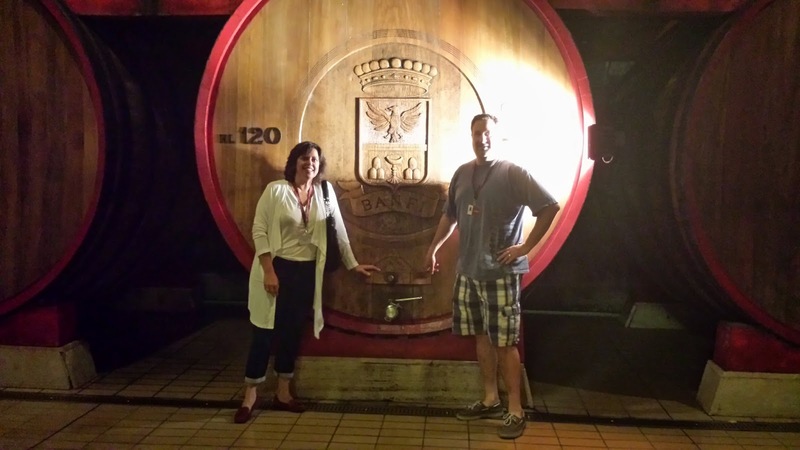 As I commented at the time, 2008 marked a stylistic shift for Tenuta Fanti – who, according to Elisa Fanti, now focuses on larger botte for aging their wines in addition to a change in Sangiovese clones from previous vintages. I applaud both changes as the wines from Tenuta Fanti have never been better. 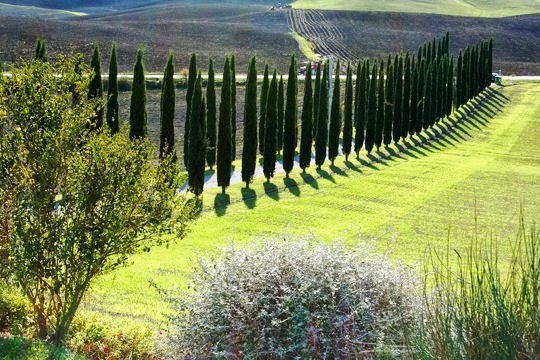 The landscape around Montalcino never fails to impress me……. La Madonna…. magical words to a Roman Catholic Italian. And Madonna happens to be the maiden name of my better half, so the next wine holds some extra meaning. The Campogiovanni Estate lies on the southwest slopes of the Montalcino hill and extends for over 65 hectares, 14 of which are dedicated to vineyards. 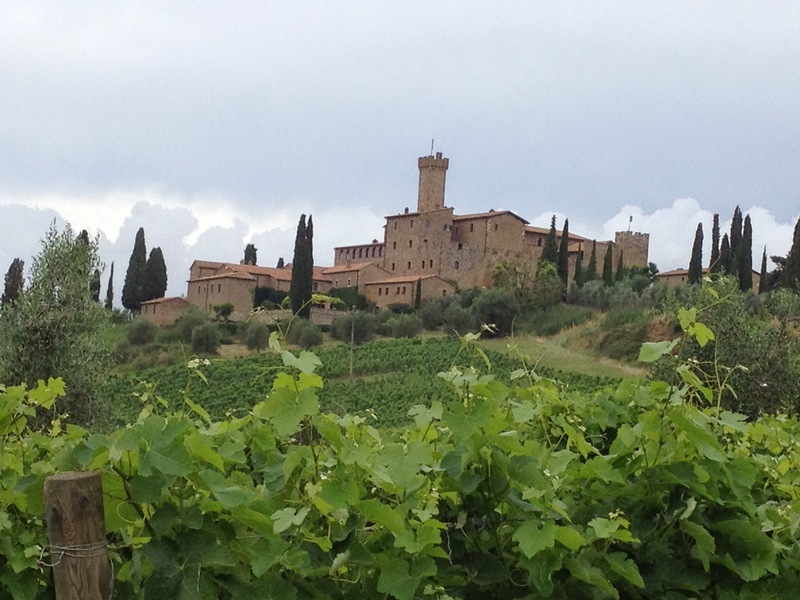 The estate is owned by the stalwart Chianti Classico producer, San Felice. The vineyards, planted as far back as 1966, are comprised of a mixture of clay, sand and minerals deposited by the sea and lie at elevations of approximately 300 meters above sea level. The 2009 is an excellent effort by this revered estate. The 2009 Campogiovanni Brunello is a deep garnet color. The aromas explode from the glass with intense ripe wild berries, exotic spices, suede and tobacco. On the palate, the wine has complex flavors of red fruits, cocoa, spices and leather with a lovely dusty texture. I love this! Fermented in stainless steel and then aged 36 months in large Slavonian botte. A great effort and a step up from the 2008. 93 points. SRP ~ $50. ﻿﻿The estate of Villa i Cipressi is situated just outside the fortress town of Montalcino, on the hillside towards San Angelo in Colle. It is a small family owned and family driven farm. Thirty years ago, the family started out as beekeepers and based their future on producing different types of honey. 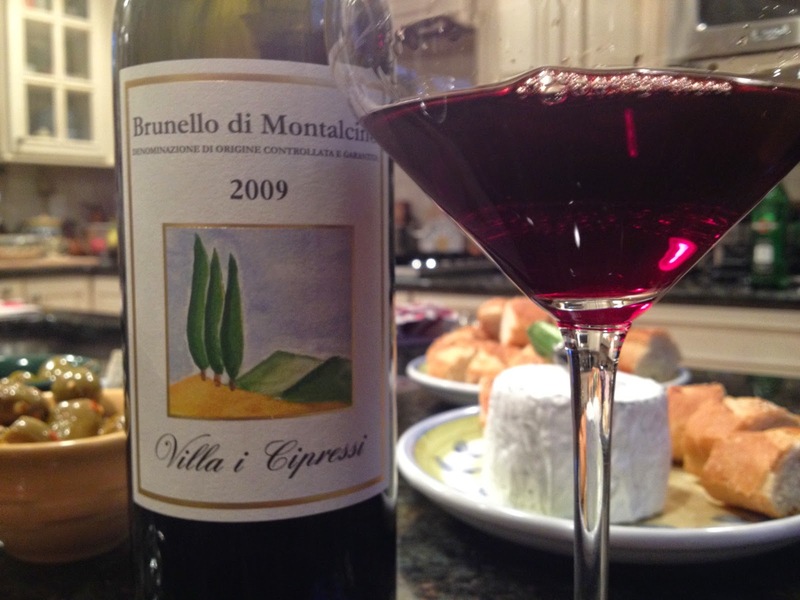 Beginning in 2000, Villa i Cipressi started producing Brunello di Montalcino – mostly at the request of local clients. The tiny estate now produces wine from 3 1/2 hectares (8 tiny acres) of Sangiovese vines in the territory of Montalcino. The vineyards are located both in the southern part of the territory and in the north-western part, and both benefit from southerly exposure which allows the vines to receive the best sunlight throughout the day. Next up was the Zebras Brunello which is a selection of the estate’s best fruit, though it is not a Riserva. It spends 2 years in oak; 60% French barrique and 40% large cask, and an additional year in bottle than the estate wine before release. It’s an artisanal step up and it’s obvious. Uccelliera is a tiny estate, all of 6 hectares and sits in the southeast corner of the Brunello zone near Castelnuovo dell’Abate, a region known for producing bolder wines due to the generally lower elevation and slightly warmer temperatures. Interestingly, the land that is now the Uccelliera farm belonged to the neighboring Ciacci Piccolomini family until it was purchaed by winemaker Andrea Cortonesi in 1986. In addition to their wonderful estate Brunello, Castello Banfi also creates a single vineyard wine in the namesake of their Castello: Poggio Alle Mura. This single vineyard, non-Riserva Brunello was the direct result of Castello Banfi’s unique clonal research program that identified the 3 best clones of Sangiovese that are suited to Montalcino, and specifcally, Banfi’s own terroir. The 2009 Castello Banfi Poggio Alle Mura is dark ruby – among the darker Brunello in this report. The nose is fairly open with black cherry, spices and roasted coffee which I find very appealing. On the palate, the wine is more austere. There’s a solid, ripe core of fruit with tannins to match. Slightly unforgiving at the moment, my experience tells me this will undoubtedly open and improve with cellaring. 91 points. SRP ~ $65. Il Poggione, along with the iconic Biondi Santi and Frescobaldi, is one of three original producers of Brunello di Montalcino. For over a century, the Franceschi family has been tending their farm southwest of Montalcino and producing wines of stature and elegance. With vineyards at 400 meters above sea level, the cool breezes from the Mediteranean, which is only 30 minutes by car from this portion of the Brunello zone, allow for cool nights and even ripening as the gentle winds help to prevent rot and fungus in the vineyards. 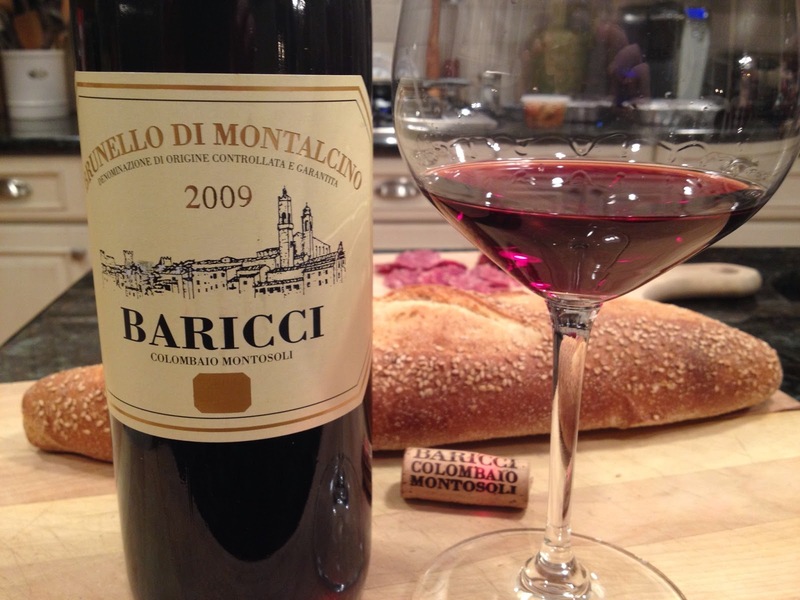 Winemaker Alessandro Bindocci described this in detail during the 2014 harvest on his blog The Montalcino Report. 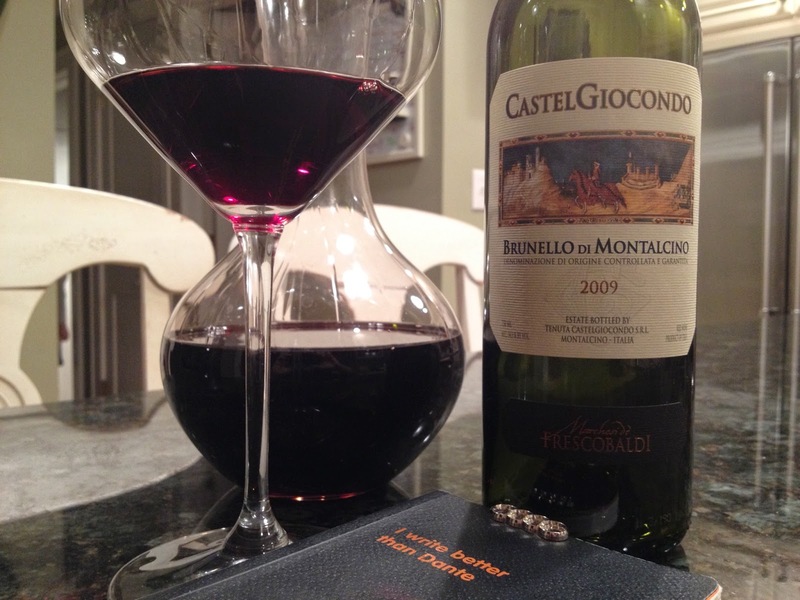 The 2009 Il Poggione Brunello is a testament to what Bindocci can do in difficult circumstances. 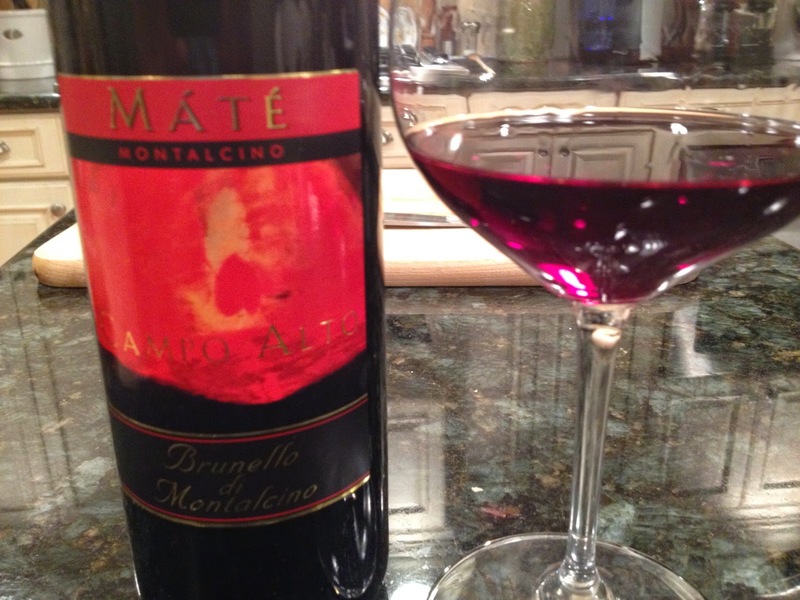 This Brunello is dark ruby with crimson highlights. Aged in a combination of cask and barrique, the wine displays aromas of cherry, soft cake spices and fresh mushrooms. Full bodied on the palate with lively ripe fruit and elegant refined tannins, the wild cherry flavors are persistent and backed by lots of fresh acidity that provides graceful structure. Deftly crafted. 91 points. SRP ~ $85. Of course the great lawyer Mastrojanni, who unfortunately I was never able to meet, must have been a man of clear vision and courage. Andrea is a man of few words and by now knows each of the estate’s vines perfectly. He knows how to grow them and make them feel good bringing ripe fruit year after year because he is there, always there, following every single detail, from a barrel which needs to be replaced or planed to a plant in need of help. He knows that this is the only way to make a fine wine: to be at its beck and call. The 2009 Mastrojanni Brunello is impressive and true to the estate and winemaker Maurizio Castelli’s style. It’s a dark ruby with a slow fade to classic copper at the rim of the bowl. This wine is vibrant and fresh on the nose and palate with aromas of crushed berries, fresh flowers and lively spice notes following through to a full bodied elegant palate on a large but fresh frame. Mastrojanni didn’t produce their exalted Brunello Vigna Schiena d’Asino in 2009 because as Andrea told me: “It was not as great as we want the Schiena d’Asino to be.” All the better for lovers of this estate as that fruit was blended into this wine. This is a delicious effort and another winner from this exceptionally consistent estate. Bravo! 92 points, and an exceptional value at about $42. Next up was a single vineyard Brunello from Mastrojanni, Vigna Loreto. Not a Riserva, but simply a strict selection of the best fruit from the vineyard. Brunello Vigna Loreto is aged in various size French oak barrels, from 15 up to 43 hectoliters and is refined in bottle up to 8 months prior to release. The 2009 Brunello Vigna Loreto is a very good wine, but not up to the level of its 2007 sibling. In the glass the wine is a dark ruby with some crimson reflections. Aromas display good delineation and offer up tobacco, spice and crushed berry notes. On the palate the wine is elegant and refined with a large ripe core of berry fruit that is accented with spice and hazelnut. Good persistence on the finish and well balanced. Still needs time to develop and come together. 90 points. SRP ~ $55. I was very curious to taste the next wine after the misstep with the 2007 that I wrote about almost two years ago. Maybe this wine showed better – but maybe I’m just hoping the 2006s I own will turn out well. 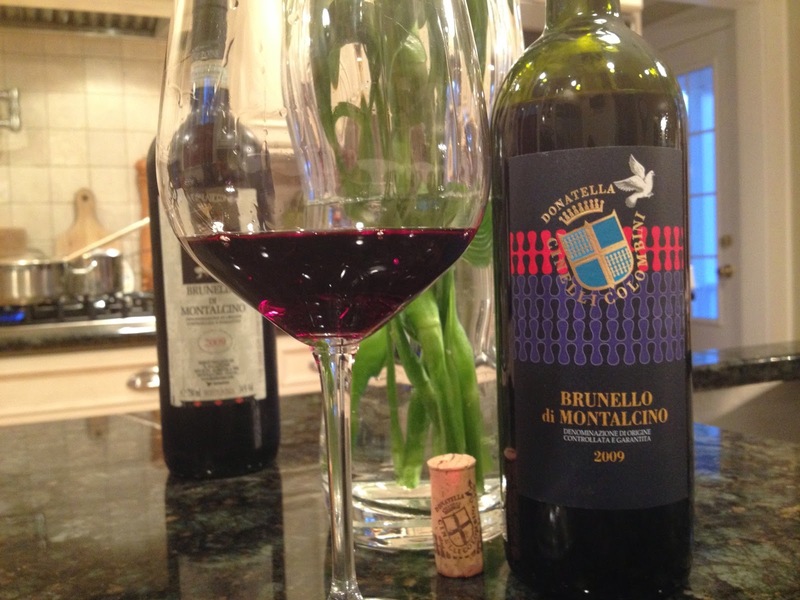 The 2009 Fuligni Brunello is a medium ruby with lighter shades of ruby at the rim of the glass. It doesn’t look concentrated, but the color belies some of the wines flavors. Dusty Tuscan road, underbrush and soft red berry aromas mingle in the glass pleasantly enough. As the wine opened, an additional note of fennel seed was observed. Medium bodied at most on the palate, this is not a bruiser by any means, but a more elegant take on Brunello. Ripe berry notes are joined by an olive and spice character. Soft wood accents are notable. The fruit picked up some intensity with some additional air time. If you’ve got this, give it a good decant. 89 points. SRP ~$60. At that price, tread carefully. Like many of the other wineries in this tasting and many of the producers I’ve spoken to, given the character of the 2009 vintage, Mate has decided not to bottle a Brunello Riserva in 2009. However, the fruit normally destined for the Riserva was partially declassed by the Mates and a vineyard designated Brunello was released in 2009 called “Campo Alto” or High Country. The vineyard that gives this fruit was planted in 1998, on a steep hill with Southwest facing exposure and an elevation of 1000-1300 feet above sea level. It is quite a trek from the Mate’s home to this vineyard and that travel imparts the name. The wine is fermented on the skins for 14 days, and then aged for 30 months in barrique and tonneaux. 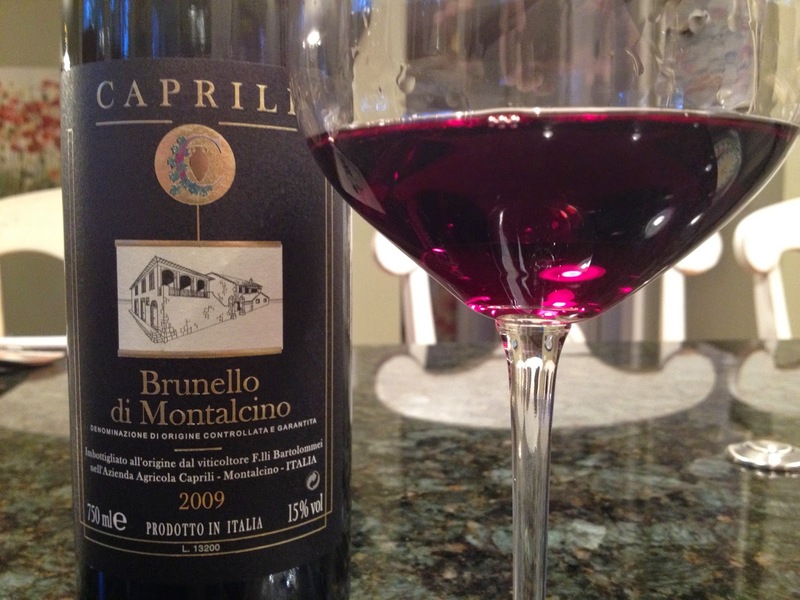 The 2009 Campo Alto Brunello is a deep violet color through to the rim. Bright and lively looking. On the nose, there are perfumed aromas of spices, alpine forest and crushed wild cherry notes. On the palate, the wine is beautifully crafted with a bright core of wild cherry, foresty pine notes, sweet leaf tobacco and spice. It’s delicious with fresh, high toned fruit that possesses brisk acidity and balance. Very well done. 92 points. SRP $65. Campo Alto’s production is very small, and as of this writing, is available only through the winery. As I tasted through these wines, I tried to create comparisons to vintages past in order to “place” the vintage among its peers. Yet even as I sit here writing, I’m not sure that’s the proper thing to do. Vintages stand by themselves. Each is different in some respect. The key is understanding the positive and negative attributes of each, in order for the reader to make informed buying decisions. I do not share the opinion of many who have roundly criticized this vintage. Nor do I share the generous view of 2009 that the Brunello Consortium employs. My mind still keeps going back to what Laura Gray told me: “Good Brunello were spread across the zone in 2009”. She’s correct, and buying carefully is warranted. And I advise buying. 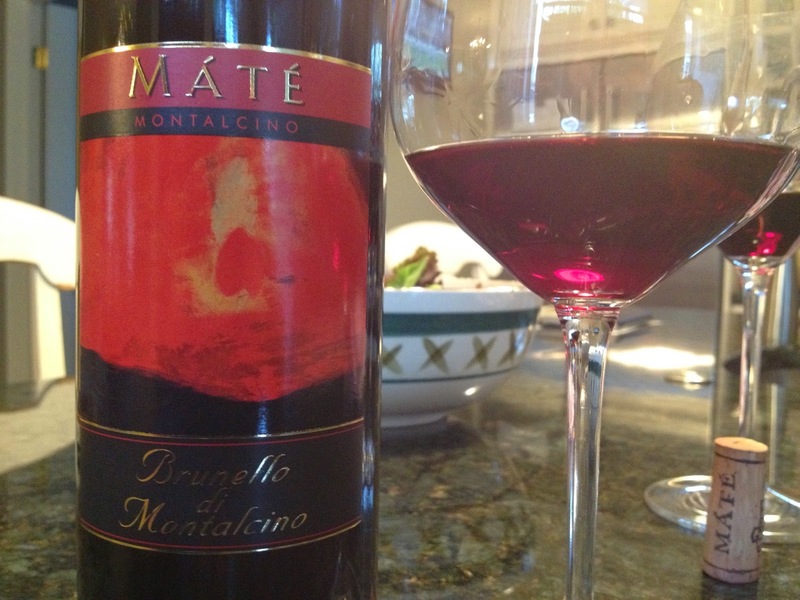 If you’re a Brunello lover, do you only buy the best vintages and drink other wines until your Brunello mature? Why not grab a few bottles of 2009 (and yes, 2008’s!) and enjoy them immediately while the better vintages rest in your cellar? Choose wisely and you will be rewarded. With that being said, in general, 2009 is a very ripe vintage with forward, spicy fruit character. As the wines lack the structure of more classic vintages (2004, 2006) they are not ideal for long term aging. However, therein lies the vintage’s benefit. The 2009’s don’t need age. They will drink well upon release and are perfectly suited for restaurant sale since they do not require aging. The best 2009’s – those from vineyards at higher elevation, display more freshness and complexity than those from lower lying vineyards. In some cases, the hotness of the year moved the wines closer to “overripe” and in those instances, the delicate complexity of the Sangiovese gets masked. Which should you buy? Well, hopefully I’ve painted good pictures as to the styles of the various wines. Different wines will appeal to various readers. I can tell you, the data above is purely numerical. There are some wines in this report I will buy that are not listed above. Furthermore, many of the SRP’s are out of line with what I see at retail, so shop around. 2009s are not yet broadly released in the market. Store shelves are flooded with 2008’s and in some cases, I still see 2007’s for sale. Good luck! Special thanks to you the readers, and to the numerous producers, importers and distributors that assisted with the creation of this report. What an outstanding report John! I have been reading your site for years now and it's one of the few I never miss. You do a wonderful job, please keep up. Francesco, I really appreciate those comments. Loyal readers like you are what makes this possible and I'm thankful for the support. Salute! John: I have to go with Franesco! 🙂 Sadly, the 2009 vintage is rough, and since the prices are still high, and since I have some 2009s in the wings, I'll have to hold off buying any more for now, especially since these wines are more expensive in NH. Dennis, I hear you and thanks for the compliments. 2009 is variable, no doubt. But there are wines that I will buy. They do serve a purpose and the freshest ones, from higher altitudes are just as lovely as some other recent vintages. That said, if you prefer to lay Brunello down, I'd stick to the more structured years like 2004 and 2006 and also save your money for the 2010's. 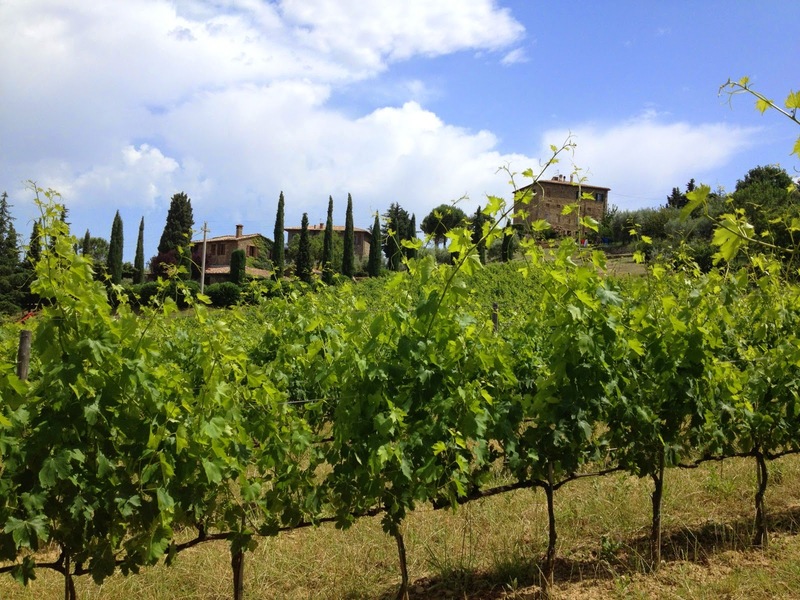 I'm getting my first taste of those wines next month at Benvenuto Brunello. Salute!